Nextel is the fourth, the smallest mobile operator in Argentina. Its coverage is somewhat limited, however, about 2 million subscribers use the services of Nextel. To use the start plans of this operator for profitable traffic termination, it is important to find a suitable offer for prepaid clients. The difference in per-minute cost between international and outgoing local calls should be as high as possible - then your earnings will be high. The cost of one Nextel SIM card is only 27 cents. Their start plans are sold at retail stores, but you can also find them at some street vendors. You can top up the balance by buying a scratch card in a kiosk, supermarket or at a gas station. The prepaid SIM card is called PowerChip and provides favorable conditions for outgoing calls. The first 30 seconds of each call cost about $0.15, after which the call becomes free. The same with the Plan Prepago tariff plan, which you can connect if you wish: the first 30 seconds of call are charged at $0.08, after which the calls become free. These terms apply only to calls within the Nextel network. Prip! Regional. The connection costs $13, the subscriber gets 100 minutes to call to any national numbers. Prip! Ejecutivo Smart. The connection costs $20, the subscriber gets 600 minutes for calls to numbers of any operators, as well as unlimited connection within the Nextel network. The choice of a plan for termination depends on the specifics of calls and the volume of terminated traffic. 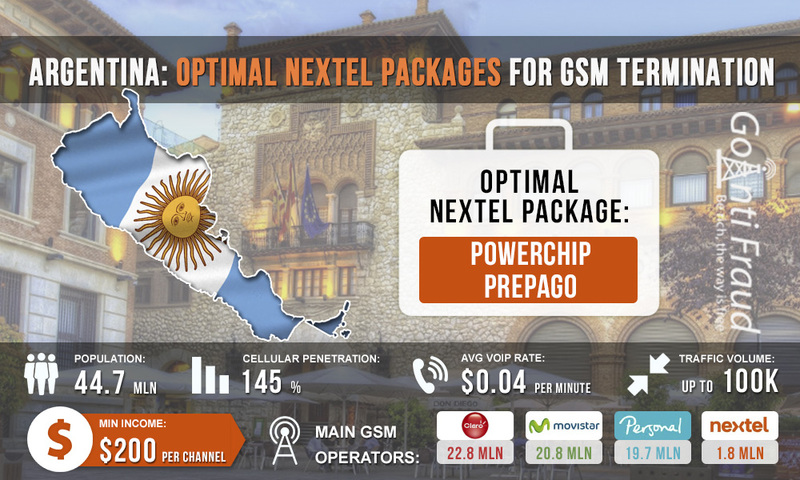 One of the best options, given the average wholesale voip rates termination in Argentina is PowerChip Prepago. Terminating for 5 hours a day, you will be able to get a minimum profit of $200 on landing of calls (from one port of your equipment).